Whatsapp video call feature which all waited for, has come to stay as whatsapp has started rolling such out. Currently, the feature is activated on beta android app. Google's Allo and Duo apps that many people jumped into. This video chat update made on whatsapp should quicken their horizon of reasoning before they will close and open their eye and they will see less users of google Allo & Duo app. This calls for a competition. Let's keep watching and see what will happen. 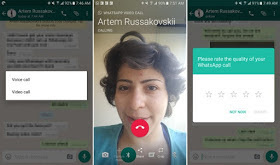 √ How To Share Applications On Apk/Zip/Pdf Files Through Whatsapp Chat App To Anyone. √ Facebook Latest Update On iOS App, Adds Ticket For Movies, Request Appointments And Many More. Now, talking of the new video calling feature, it is now available on Whatsapp version 2.16.318 beta. To test the beta app, simply get it installed on your device by downloading the APK Mirror Here. HOW TO MAKE A VIDEO CALL CHAT ON THE LATEST BETA WHATSAPP APP. ✔ Next, click on the “call” button. ✔ Now choose video call to start your chat with the person you selected from your contact initially. That's it for the first method...enjoy! ✔ Next Click on where you see “select contact” button and now the contacts which you selected will load with the video button being displayed next to the voice call button. The video call chat can be enjoyed only when you are using the latest whatsapp beta app. So we are hoping this feature to reach all using whatsapp application for Android and iOS devices. Don't be selfish, share with friends.